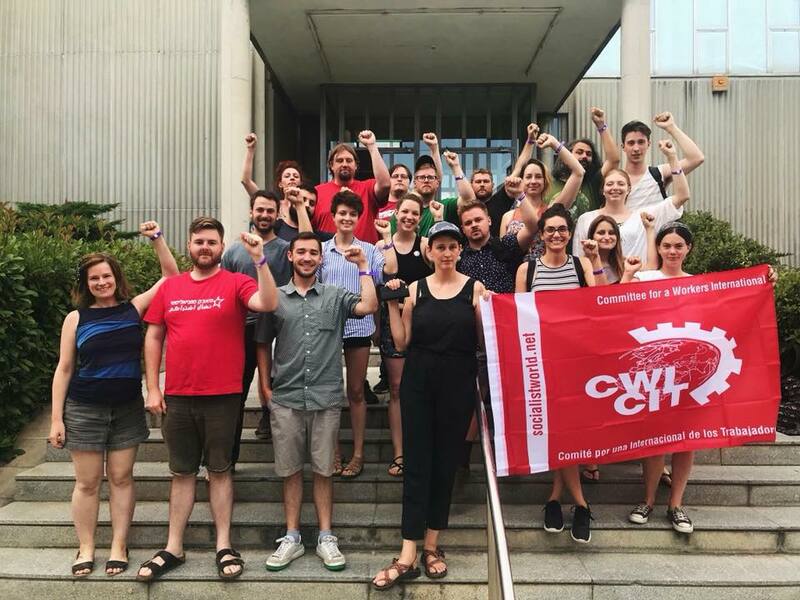 Socialist Alternative is connected in political solidarity to the broad, cross-border movement for a socialist world through the Committee for a Workers International (CWI). The annual CWI summer school brings together activists from every inhabitable continent to address the crisis of capitalism on a global scale, and to share lessons and strategies for building a unified movement. A delegation from the U.S. joined hundreds of socialists from around the world in July for a week of discussion. Grace Fors, a member of Boston Socialist Alternative, reports on the central themes of the school in Barcelona. Ten years out from the last recession, the next economic crisis is inherent in the shallow recovery. The massive debts taken on by governments, firms, and households will never be paid off. Global debt stands at $247 trillion and counting, now 307% of world GDP. For every person on Earth there is a debt of $30,000. Widespread underemployment and the rise of low-paying, insecure jobs expose capitalism’s fundamental inability to make full use of the productive power of society. Useless financial gimmicks like buying back stock and hoarding cash offshore take precedence over investment in the economy. These parasitic practices serve to paint the picture of a viable system, at the expense of the working class and society as a whole. Gutting social programs, privatizing public goods, and attacking pensions have shifted the massive debt burden onto working people. With the current crisis reaching new depths, the post-WWII boom which allowed these safety nets to be set up is no longer replicable. There remains no economic basis for reforms, but we can replicate the powerful movements that forced these concessions half a century ago. Defending these basic living standards against austerity will require mass mobilizations, a combative trade union movement, and ultimately a fundamental transformation of the system. The promise of freedom and prosperity under capitalism is more hollow than ever, as imperialist proxy wars destabilize entire regions with no end in sight to the violence. It has been 17 years of war in Afghanistan, and we’ve seen ever worsening levels of monstrosity unfold in Syria and Yemen. Youth unemployment in the Middle East and North Africa is higher than any other region in the world, and the masses have truly seen the worst of what capitalism has to offer. As long as the big military powers are able to stir up regional conflicts and exploit sectarian divides for their own ends, there is no solution to this ongoing crisis. In the meantime, the damage caused by these wars is immeasurable. The year 2017 produced 68.5 million refugees. This migrant crisis has contributed to the insidious rise in support for right populism. Parties like the AFD in Germany and the Sweden Democrats rode racist and xenophobic backlash into the national spotlight by conflating deteriorating living conditions with immigration. Hard right and even fascist elements have emerged in Italy and Hungary. Violent attacks on oppressed minorities show the horrifying impact of their reactionary ideas, and highlight the immediate day-to-day stakes of political struggle. Ultimately these forces will fail to fulfill their promises. Especially when faced with another recession, reality will betray their scapegoating and expose the powerlessness of right populism to improve living conditions on the basis of capitalism. They aim to infiltrate and fracture the working class, which united in solidarity could decisively crush these far right threats. In contrast to these right populist reactions, we have also seen an exciting growth of support for organizations of the left. Parties like PODEMOS in Spain, France Insoumise, Die Linke, and Left Bloc have won millions of votes and supporters with anti-austerity programs. This is an important first step, and the CWI actively encourages these emerging channels of struggle. However, there is danger in simply waiting for a Corbyn or Mélenchon to take over and single-handedly transform the system from within. Only movements from below have the power to pressure these forces to take a firm, combative stance and guide struggle forward. The masses will need strong mass organizations to make gains under regimes which have seized on the hysteria to consolidate state power. Xi Jinping’s coronation as ruler for life in China was a strategic attempt to fortify against the looming threat of resistance from below. Censors have had to keep up with waves of online protests, and public demonstrations by retired army veterans undermine the hyper-nationalist rhetoric of the dictatorship. Meanwhile the sensationalized “Russiagate” narrative has actually helped Putin’s regime invoke the image of Russia under threat from the outside. This narrative keeps Putin in power virtually unopposed while LGBT activists are jailed at PRIDE, and provincial languages and cultures are strictly repressed. A growing number of these crackdowns are rooted in struggle over national sovereignty. The only pro-independence party in Hong Kong has been banned. As the movement against Palestinian occupation becomes bolder, Israel responds with massacre of peaceful demonstrations and jailing activists like Ahed Tamimi. The independence movement in Catalonia erupted into a full class battle as the Spanish State quickly mobilized its forces against the Catalan masses. The “tractor armada” that protected polling stations from police during the October 1 referendum stands as an enduring symbol of how workers instinctively align with the struggle against state repression. In April, crane drivers in China struck across multiple provinces, inspiring a similar multi-provincial strike by truck drivers a month later. Both strikes were illegal. In late May, truck drivers in Brazil brought the regional oil economy to a halt for weeks. The rolling strike by French rail workers held ground for over ten weeks during the 50th anniversary of the May 1968 uprising. As the CWI school took place, Amazon workers across Europe struck on Prime Day, dealing a blow to the pockets of the richest man in the world! While the gains of these work stoppages have been limited, they are part of a broader process of radicalization that will be the focal point of our work in the CWI. Another key feature of the fightback is the rapidly developing feminist consciousness, that has brought thousands of working class women into the streets. This year in Spain, 6 million workers participated in a 24-hour general strike on International Women’s Day. The movement in Ireland to repeal the 8th amendment, which forced the establishment to overturn the oppressive abortion ban, proves the stunning power of movements driven by young women. Since then, there have been new breakthroughs in Latin America, with feminist movements in Argentina, Chile, and Brazil mobilizing around the demand for safe, legal abortion! Youth are turning against the system in historic numbers. Born into war and declining living standards, young people now face the grim reality of mass unemployment, student debt, and a lack of affordable housing. This period of crisis is creating a new generation of activists, galvanized by each emerging struggle to fight together for their future. In the long term, the struggles of workers, women and youth are on a collision course with capitalism. They have tremendous influence over the rest of society, and by uniting their interests under a common socialist program these movements can reach their maximum potential! Our socialist feminist platforms ROSA and Libres y Combativas, and organizations such as Syndicato de Estudiantes and Socialist Students incorporate Marxist perspectives and tactics into the fight against oppression of all kinds. Throwing our weight behind key points of struggle is one of our most successful means of advancing the broader fight for socialism. The goal is not only to equip new movements with a way forward on a strategic basis, but also to link together the forces that have the power to transform society. The energy of these social movements combined with the lessons and experience of the labor movement can be an unstoppable force against the inequality and exploitation built into the system. We stress the need for new, independent workers parties that can unite the masses under a common program aimed at taking on capitalism. This year an initiative of our second largest section, the Democratic Socialist Movement, received official status from the state to participate in elections as the Socialist Party of Nigeria! Using elected office will be a critical tool in this era of eroding faith in the establishment. Activists can seize on this opportunity by participating in elections for genuine class fighters rooted in struggle. Can electing the right people change the system from the inside? No, but the right people, backed by a sustained movement, can tactically apply the power of their office to amplify radical demands and tip the balance in favor of the working class. The old order is in full-blown crisis, and the strong working class movement we need to wage the struggle for a new society is just beginning to find its strength. While the imperialist powers divide along national lines and fight amongst themselves for their share of the loot, they lay the groundwork for a new internationalism to unite millions under the banner of socialism!